I have such fond memories of my grandmother! She was a southern gal and her meals and desserts were delicious! I remember the words of wisdom she gave to me. I clung to them because she loved me unconditionally and her words were straight from the heart! I'm so glad that I had her all the way until I was in my 20's. She lived until she was 92. I believe she had some great genes, but she also took care of herself and was careful to take her medications, including a daily statin for high cholesterol. Statins are not just for the elderly. For example, I have a friend who lights up a room when she walks in! She's so funny, and can tell a story like nobody else! 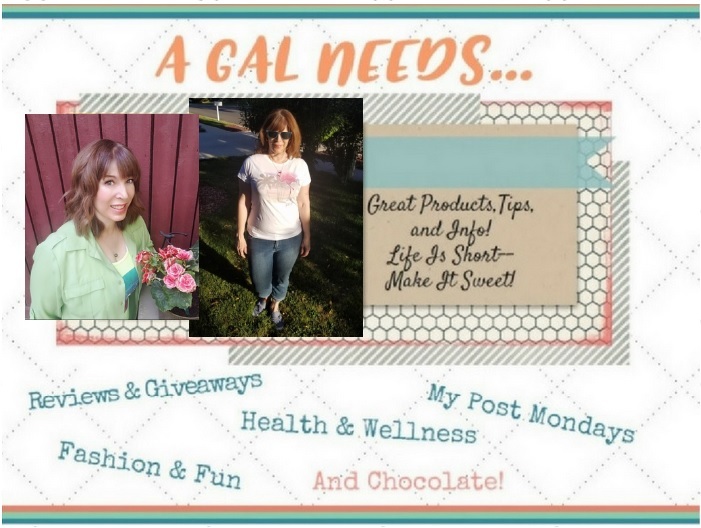 When she gets off work, she likes to unwind by getting social with friends, eating, and staying out late. However, over time she started gaining weight and wasn't taking care of herself. It all went south one night when she had trouble breathing, started sweating profusely, and had intense vertigo. She went to the doctor and got tested. When the results came back, she found that she had diabetes, high blood pressure, high cholesterol, and her liver and kidneys were failing. The doctor told her that if she didn't lose weight, get her diabetes, high blood pressure, and high cholesterol under control, she would be dead in a year. Needless to say, she started working on it. She was given a statin to lower her cholesterol, medication for her diabetes, and was told to lose weight, and to stop drinking and smoking. It has been over a year now and she looks and feels fabulous! She took her doctors' advice and lost 69 lbs. She controls her cholesterol with a statin. Her family has been so grateful that she made these changes and has lowered her risk for heart disease and other illnesses. I was really surprised to find out that more than a few people I know depend on statins to keep themselves within the safe range for high cholesterol. High cholesterol is a silent killer if not kept under control and statins are true miracle workers if you need them. death in America. To lower cholesterol and help prevent heart disease, doctors often prescribe statin medication. Surprisingly, despite the fact that statins are proven to lower cholesterol and fight heart disease, up to 50% of people stop taking their statins within one year of starting it. This is risky because high cholesterol doesn't just go away. The good news is that there are multiple statins available and by talking to your doctor, it is possible to switch to a statin that fits your individual needs. To understand why people stop taking their statin, a recent poll of more than 5,000 Americans aged 45+ with high cholesterol took a poll called ACTION: THE Statin Survey, and discovered some interesting findings. 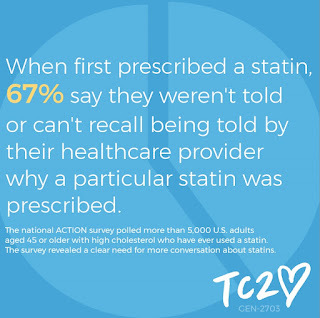 Only one third (33%) of people say their healthcare provider explained why that particular statin was being prescribed when they were first prescribed a statin. Just 21 percent of patients say that their healthcare provider told them that there are different types of statins available when first prescribed a statin. Roughly a quarter of patients (24 percent) currently taking a statin say they had challenges with the first statin they took. Only 18 percent of people say they were told that their prescribed statin medicine could potentially interact with other medications and dietary supplements. I am proud to support a new educational campaign called Take Cholesterol to Heart to help people understand their treatment options for high cholesterol and motivate them to speak up if they are thinking about stopping their statin. Take Cholesterol to Heart provides great tools and strategies to help people "master the cholesterol conversation" with their doctor. As you may know, there are multiple statin medicines, so it's important to talk regularly with your doctor about your treatment plan, including a statin that is right for you! 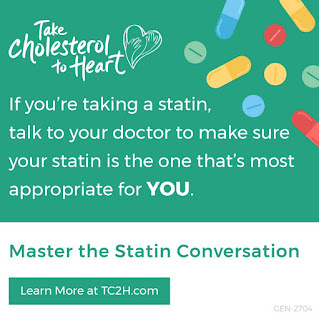 If you or someone you love takes a statin, please visit TakeCholesterolToHeart.com for a number of helpful resources, including a doctor/patient discussion guide, a quiz on statins and tips for caregivers. * Harris Poll conducted ACTION: The Statin Survey (Understanding Patient Adherence and Concerns with Statins, and Medication Discussions with Physicians) online on behalf of Kowa Pharmaceuticals America, Inc., within the United States from July 7- August 4, 2017, among 5,014 U.S. adults aged 45 or older, who have been diagnosed with high cholesterol, and have ever used a statin to treat high cholesterol. This online survey is not based on a probability sample and therefore no estimate of theoretical sampling error can be calculated. For complete survey methodology, including weighting variables, please contact Erin Bittner at W2O Group, 212-301-7226.